Prodded by the Supreme Court, the Home Ministry has for the first time taken positive steps to protect the migrant citizens from North Eastern states residing across the country, especially in Delhi, where the community members are complaining of racial discrimination, verbal abuse and physical assaults. 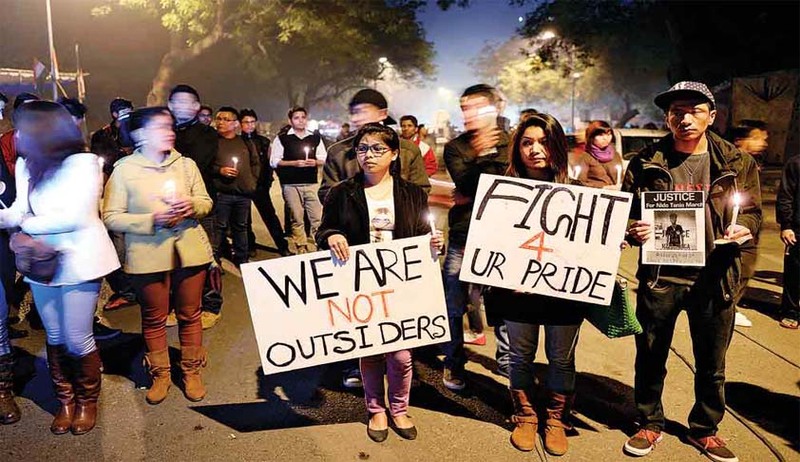 Three years after 19-year-old student from Arunachal Pradesh Nido Tania fell victim to a racial attack at the busy Lajpat Nagar market in the national Capital, the Centre submitted before the Supreme Court that it has lined up a number of measures to ensure that other North-east Indians like him can live peacefully with a sense of honour, free from the fear of racial discrimination, verbal abuse and physical assaults. The court was hearing a public interest litigation filed by one Karma Dorjee in 2014, soon after Tania’s death seeking urgent measures to protect the citizens from the country’s North Eastern states from racial discrimination. Such a mechanism in Delhi Police will be monitored by the MHA and based on its experience, such mechanism will be replicated in other metropolitan cities, the officials associated with drafting of the document told. The affidavit says that an officer of the rank of the additional commissioner of police hailing from the Northeast has been designated as in-charge of special police unit for Northeast region. Similarly, an officer of the rank of joint commissioner of police/IGP has been appointed as nodal officer for Northeastern states issues. Separate district additional commissioners and DCPs have been appointed as nodal officers, who are required to interact with the citizens coming from the Northeastern states and residing in their districts. Special recruitment drives have been undertaken and will continue to be taken for appointment of citizens hailing from Northeastern states to be recruited as officials in the Delhi Police. A number of steps have been taken for the sensitization of policemen on this issue, says the MHA. On October 17, the SC asked the Centre to set up a suitable mechanism or nodal agency to oversee and pursue implementation of the recommendations made by the MP Bezbaruah Committee not only in relation to the prevention of crime against people from the Northeast region of this country but also in relation to creating an atmosphere conducive for such communities from the far east to get proper assimilation in the mainstream society. SC had also taken note of the recommendation by Bezbaruah panel which had suggested amendment of Section 153 IPC to make racial slurs a distinct offence. It also considered the petitioner's plea that India needed to enact stronger laws since it had ratified the International Convention on the Elimination of All Forms of Racial Discrimination, 1965. Section 153A of the IPC punishes acts of promoting enmity between different groups on grounds of religion, race, place of birth, residence, language, and committing acts prejudicial to the maintenance of harmony. The Centre decided to file the affidavit after SC on October 17 pulled it up for not being able to take enough measures to prevent racial discrimination of people from the Northeastern states. When the Centre said steps had been taken to prevent racial abuse of the community, a bench headed by Chief Justice TS Thakur said: “The steps may be on paper. "It is not judicially visible on the ground. You identify a nodal agency so that the court can question it about the complaints of racial abuse received by it and the steps taken". SC had told the Centre that there is a sizeable population of students from the Northeastern states in Delhi, Bengaluru, Pune and Chandigarh. It wanted the Centre to present it with a picture perfect mechanism for Delhi and said if it was acceptable, it will ask the authorities at other educational hubs also replicate it. Out of camaraderie and safety concerns North-easterners living in Delhi have gravitated to ghettoisation, primarily in South and North Delhi areas like Munirka, Kotla Mubarakpur, Satya Niketan, Chirag Dilli and Outram Lines. After this Hon’ble Court had made observations during the hearing on 17.10.2016, the Ministry of Home Affairs, Govt. of India has decided that – in Delhi, a Police Officer of the rank of Special Commissioner will supervise the functioning of the Delhi Police as regards problems faced by the people of North-Eastern Region. The said Special Commissioner of Police will ensure that Delhi Police responds to these issues in a constructive and proactive manner and they do not face any racial discrimination. Such a mechanism in Delhi Police will be monitored by the MHA and based on its experience, such mechanism will be replicated in other metropolitan cities.